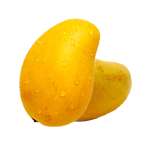 The Manila mango is grown in the Philippines, US and Mexico. This mango was introduced to America 200 years ago and now is a popular variety here. This mango has a thin delicate skin and it is a wonderful delight when eaten ripe. It is available all year round in Philipinas.